Too much poverty, or too much aid? The chart above shows the value of the ruble vis a vis the U.S. dollar. 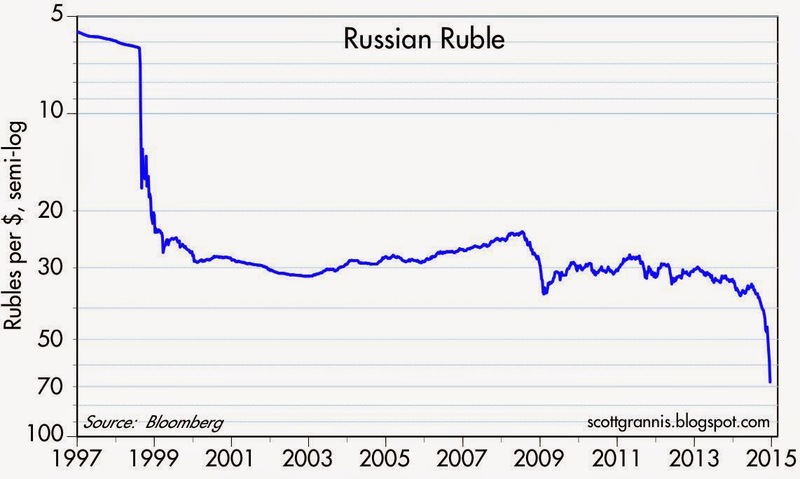 Since 1997, the ruble has lost 91% of its value. The most recent collapse is less than half as bad—so far—as the collapse that began in 1998 when Russia defaulted on its foreign debt. 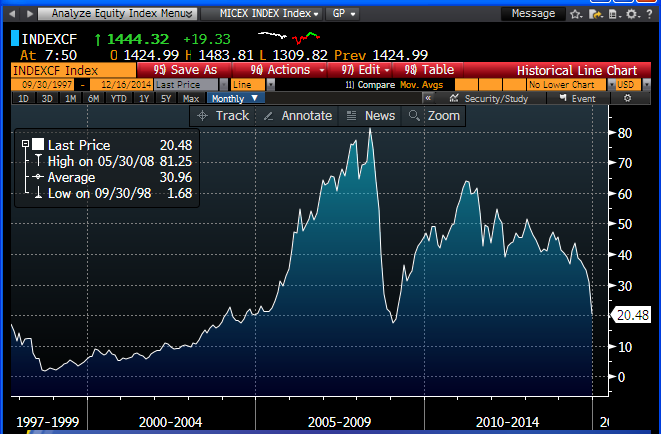 The chart above shows an index of the value in dollars of the Russian stock market. Today it is worth about as much as at the end of 2008, during the depths of the global financial crisis. Since the pre-crisis days of 2008, the value of Russian equities, as measured in dollars, has fallen by 75%. Since last June, when oil prices started to collapse, the dollar value of Russian equities has fallen by about 55%. 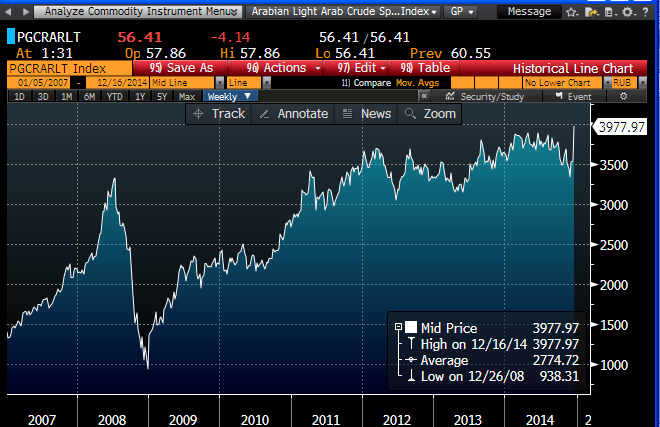 The chart above shows the price of Arab Light Crude in rubles. At the end of the day, the devaluation of the ruble has just about completely offset the decline in crude prices; exporters of Russian crude today receive about the same amount of rubles per barrel as they have for the past three years. But that's only half the story: since 2010, Russian consumers today are paying over twice as much (in rubles) for imported goods and services. Eventually, that will result in a huge increase in Russia's inflation rate, which was just under 8% last June. The Russian economy is almost certainly in the midst of a recession, and on top of that inflation is going to be running in the very strong double-digits for the foreseeable future. It reminds me a lot of what it's like to live in Argentina, and it's not pleasant. But it's not the end of the world, either. all of which strongly implies that while the USA AIN'T perfect, it's better than most places. Putin is deluded. The only course for Russia is to join Western Europe, not fight it. More economic and political freedom, not less. Prosperity, not a garrison state.
" But it's not the end of the world, either." Could you please clarify this sentence. Thanks. As bad as it sounds for Russia, my point is that it's not a catastrophic problem. Russia will not collapse, and its problems should not significantly affect the global economy. Thanks. Why do you think Russia will not collapse (default) because it has enough reserves and exports in foreign currency while costs in rubles which offset the drop in crude as you have shown? I'm trying to understand this point better. How would Russia survive when its reserves are quickly depleted while its debt is in foreign currency + mass local inflation. So my concern is that if Putin is brave enough, or crazy enough, to fly Russian fighter jets dangerously close to commercial aircraft, practice bombing runs on commercial ships and illegally over-fly nearby nations air space; WHY WON'T HE DO THE SAME AGAINST SAUDI ARABIA. He could argue that the Saudis and Emirates have engaged in economic war against Russia, Iran, Libya, Venezuela, Argentina, Mexico, etc. A blockade of the Arabian Sea to Saudi and Emirates oil exports would dramatically raise the price of oil and solve much of Russia economic problems. Or he could lob a few cruise missiles at Saudi and the Emirates oil facilities. Why not play tough with the filthy rich, spoiled, party-boy Saudi Princes. They would fold in a mille-second, I should think. I was in Moscow and St. Petersberg this summer visiting listed companies and was mostly impressed with the management and IR I met. Very professional and they explained their companies and situation well. I did not like everything, but that is why I travel - figure out what is good and bad. Or at least try my best.